Setting up a visually pleasing product display may not be your forte, but you can do it well if you think about your existing customers' and potential customers' needs. The first thing your patients and potential customers see is your practice's exterior and the path to the front desk. If you want to increase your retail sales, create an enticing visual display of your frames and other products in their walking path so that they can't ignore it. Opticians understand the need for a visual display that tells the story of the consumer and how the product aids that story. Read on to see how your frame board and product displays can tell a story in your optical practice. One of the main reasons customers enjoy walking through IKEA's showroom displays instead of cutting straight to the marketplace is because it gives them ideas on how they can use the products in their space. Also, IKEA's products aren't high in price, so most customers are actually shopping to buy rather than just plan. Take a page from IKEA's book and display your middle-tier, more affordable frames so that customers don't balk at the price tag. You can even display ads or photos of people wearing the frames while going about their daily lives, if you have them on hand. 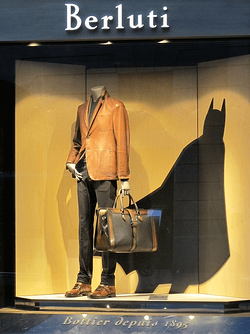 For those of you have have visited large department stores in New York or elsewhere, you know their window displays have been attracting crowds for decades. Their displays range from whimsical and elaborate to minimal and sleek, depending on their clientele. If you see patients who gravitate towards a sleek look, showcase your more modern frames in the front on stands that are fun and unique, but don't obscure the product. However, if you attract a crowd that appreciates innovation and the arts, you can brainstorm a few creative ways to display your frames such as Berluti has done with their menswear. They took a concept everyone can recognize and identify with (Batman) and related it to how wearing their product would feel. The flat lay is the bread and butter of product photography for brands, bloggers, and e-commerce. Most of us have seen one, but it's hard to put into words why they're so visually pleasing. Create a flat lay of all the parts that go into making a frame, glue it to a piece of wood, and prop it up in your display for an industrial look. To create more of stylized look, you can build flat lays that include glasses frames and accessories that someone would wear with them. For example, a set of retro frames could include a pocket-watch, bowtie, silk scarf, and lighter. With such a display, you're selling the frames as a fashion statement and way to express the shopper's personality. If your practice is surrounded by retail stores, other medical practices, and busy buildings, the best way to capture people's attention is through a jaw-dropping art display. Anthropologie sets itself apart with artistically engaging displays of paper mache, stuffed animals, hanging foliage, and flying birds. Of course, they don't lose sight of their purpose because their products are in the center of the art. We recommend you hire an artist or display specialist to build you an unforgettable display that you can keep for years. The possibilities are endless when you're intentional with your product displays. Make sure that you're not leaving your most popular frames on your frame board. Place your best frames in the center of your waiting area or near your front desk, so that they can get conversations started for your opticians. Looking for more advice on attracting new patients, boosting sales, and scaling your practice? Read how small businesses do it in our free ebook below.